Jeffrey Ubben's 13F portfolio value decreased from $10.17B to $8.03B this quarter. ValueAct increased Citigroup and Morgan Stanley while reducing Alliance Data Systems and Armstrong World Industries during the quarter. 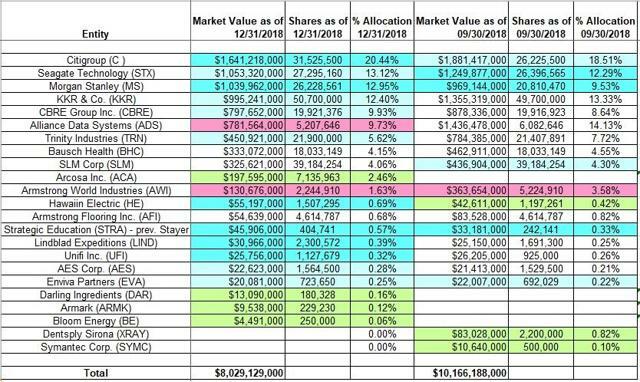 The top three positions are Citigroup, Seagate Technology, and Morgan Stanley, and they add up to ~47% of the portfolio. This article is part of a series that provides an ongoing analysis of the changes made to Jeffrey Ubben’s 13F stock portfolio on a quarterly basis. It is based on Ubben’s regulatory 13F Form filed on 02/14/2019. Please visit our Tracking Jeffrey Ubben’s ValueAct Portfolio article for an idea on his investment philosophy and our previous update for the fund’s moves during Q3 2018. This quarter, Ubben’s 13F portfolio value decreased ~21% from $10.17B to $8.03B. The number of holdings increased from 19 to 21. The top three positions are at ~47% while the top five are at 69% of the 13F assets. The largest position is Citigroup which is at ~20% of the portfolio. To know more about ValueAct’s activist style of value investing, check out Deep Value: Why Activist Investors and Other Contrarians Battle for Control of Losing Corporations. Note: ValueAct is known to have a ~10% activist stake in Rolls Royce (OTCPK:RYCEY). The position was established mid-2015 and increased substantially in November 2015. In 2016, they got a seat on the board in exchange for restrictions including not being allowed to publicly criticize Rolls Royce. That restriction was relaxed last April. Arcosa Inc. (ACA): ACA is a 2.46% portfolio stake that came about as a result of the spinoff from Trinity Industries. Trinity shareholders received one share of Arcosa for each Trinity share held. ValueAct held ~21.4M shares of Trinity for which they received ~7.1M shares of Arcosa. The stock started trading at ~$28.50 and currently goes for $31.55. Darling Ingredients (DAR), Aramark (ARMK), and Bloom Energy (BE): These are minutely small stakes (less than ~0.2% of the portfolio each) established this quarter. Note: Bloom Energy had an IPO in July. It started trading at ~$23 and now goes for $14.70. Dentsply Sirona (XRAY) and Symantec Corp. (SYMC): These two positions purchased last quarter were disposed this quarter. XRAY was a very small 0.82% position established at prices between $37.50 and $48.50 and sold this quarter at prices between $34 and $38. It is now at $41.22. SYMC was a minutely small 0.10% position. Alliance Data Systems (ADS): The majority of the original position was purchased in Q2 2016 at prices between $186 and $226. There was a ~50% increase in the following quarter at ~$200 per share. The next two quarters saw another ~15% increase at prices between $200 and $250. This quarter saw a ~15% selling at prices between $144 and $238. The stock currently trades at ~$175 and the stake is at ~10% of the portfolio. Note: ValueAct controls ~9.5% of the business. Armstrong World Industries (AWI): AWI stake was established in Q2 2014 with the bulk purchased next quarter at around the mid-$40s price-range. Last year saw a ~75% selling at prices between $55 and $72. The stock currently trades at $74.32. As a percentage of the portfolio, the position is at 1.63%. Note: AWI is an activist stake and ValueAct was involved in the spinoff of Armstrong Flooring in April 2016. They have had a presence in the board since December 2014. Citigroup (C): The C position established in Q4 2017 saw a ~500% increase in Q1 2018 at prices between $67 and $80. Last two quarters saw another ~25% combined increase at prices between $49 and $75. The stock currently trades at $64.12. It is currently the largest 13F position at 20.44%. For investors attempting to follow ValueAct, Citigroup is a good option to consider for further research. Seagate Technology (STX): The large (top three) ~13% STX position saw a huge ~220% increase in Q3 2016 at prices between $23 and $38.50. There was another ~45% increase in Q2 2017 at prices between $38.75 and $50.50 and that was followed with a ~55% increase the following quarter at ~$33 per share. The stock is now at $47.48. Last three quarters have seen a combined ~27% increase at prices between $36 and $62. Note: ValueAct owns ~9% of the business. Morgan Stanley (MS): MS is a large (top three) ~13% portfolio stake established in Q2 2016 at prices between $23.50 and $28 and increased by ~10% the following quarter at prices between $25 and $32. Q4 2016 saw the pattern reverse: ~35% reduction at prices between $31.50 and $44 and that was followed with another one-third selling in the following quarter at prices between $41.50 and $47. The stock is now at $42.41. Last three quarters have seen a combined ~45% increase at prices between $37 and $55. KKR & Co. (KKR): KKR is a large (top five) 12.40% portfolio position established in Q2 2017 and increased by a whopping ~800% the following quarter at prices between $18 and $20.50. The stock currently trades at $22.79. For investors attempting to follow ValueAct, KKR is a good option to consider for further research. There was a minor increase this quarter. Note: ValueAct controls ~10% of the business. CBRE Group (CBRE): CBRE is a large (top five) ~10% of the 13F portfolio stake. The majority of the original position was established in 2011 & 2012 in the mid-to-high-teens price-range. Q4 2016 saw a ~20% increase in the mid-to-high $20s price-range. There was an ~18% reduction in Q2 2017 at ~$35.20 per share and that was followed with a ~15% selling the following quarter at ~$35.90 per share. Q4 2017 and Q1 2018 also saw another ~31% selling at ~$44 per share. The stock is currently at ~$50. This quarter saw a marginal increase. Note: ValueAct controls ~6% of the business. Trinity Industries (TRN): The ~6% TRN stake was roughly doubled at ~$13.75 per share in Q3 2016 and that was followed with another ~25% increase the following quarter at ~$12.25 per share. Q3 2017 saw another ~11% stake increase at ~$18.75 per share. There was an ~8% increase in Q4 2017 at ~$22.25 per share and that was followed with a ~15% increase next quarter at ~$23.25 per share. The stock is now at $23.63. This quarter also saw a ~2% increase. Note: ValueAct has a ~14% ownership stake in the business. The prices quoted above are adjusted for the Arcosa Inc. spinoff that closed in November. Hawaiian Electric (HE): The 0.42% HE stake was purchased last quarter at prices between $34.40 and $36.15 and increased by ~25% this quarter at prices between $35 and $39. The stock currently trades at $38. Note: On Hawaiian Electric, ValueAct has disclosed that it is the largest position in their newly launched VAC Spring Fund. Part of the thesis is that Hawaii is the perfect place to power electricity infrastructure. Also, HE has a banking business which can source the funding of rooftop solar cells. AES Corp. (AES), Enviva Partners (EVA), Lindblad Expeditions (LIND), Strategic Education (STRA) and Unifi Inc. (UFI): These are minutely small (less than ~0.50% of the portfolio each) stakes that saw increases this quarter. Note 1: ValueAct controls ~5% of Lindblad Expeditions and ~6% of Unifi Inc. Note 2: Strayer Education merged with Capella Education in an all-stock deal in August. The business was renamed Strategic Education after the close of the transaction. Bausch Health (BHC) previously Valeant Pharmaceuticals (VRX): The BHC position is now at 4.15% of the 13F portfolio. ValueAct controls ~5.3% of the business. It is a very long-term stake. Q1 2017 saw a ~20% increase at ~$10.85 per share. The stock is now at $23.16. Note: ValueAct first purchased Valeant in 2006. Their team was involved in the transformation of Valeant from an early-stage pharmaceuticals business to the behemoth it is today. SLM Corp. (SLM): SLM was a very small 0.83% of the portfolio stake established in Q1 2018. Next quarter saw the stake increased by ~410% at prices between $11 and $12. The stock is currently at $11.15. Ubben controls ~9% of the business. The stake is now at ~4% of the portfolio. Armstrong Flooring Inc. (AFI): The very small 0.68% AFI stake came about as a result of the spinoff from Armstrong World Industries that closed in April 2016. The terms called for shareholders to receive two shares of AFI for each share of Armstrong World Industries held. ValueAct had 9.2M shares for which they received 4.6M shares (17.9% of the business). AFI started trading at ~$12.50 per share and the shares now go for $15.03.